The abundance of sodium (Na), its low-cost, and low reduction potential provide a lucrative inexpensive, safe, and environmentally benign alternative to lithium ion batteries (LIBs). The significant challenges in advancing sodium-ion battery (NIB) technologies lie in finding the better electrode materials. Experimental investigations revealed the real potency of germanium (Ge) as suitable anode materials for NIBs. However, a systematic atomistic study is necessary to understand the fundamental aspects of capacity–voltage correlation, microstructural changes of Ge, as well as diffusion kinetics. We, therefore, performed the Density Functional Theory (DFT) and Ab Initio Molecular Dynamics (AIMD) simulation to investigate the sodiation–desodiation kinetics in germanium–sodium system (Na64Ge64). We analyzed the intercalation potential and capacity correlation for intermediate equilibrium structures and compared our data with the experimental results. Effect of sodiation on inter-atomic distances within Na–Ge system is analyzed by means of Pair Correlation Function (PCF). This provides insight into possible microstructural changes taking place during sodiation of amorphous Ge (a-Ge). 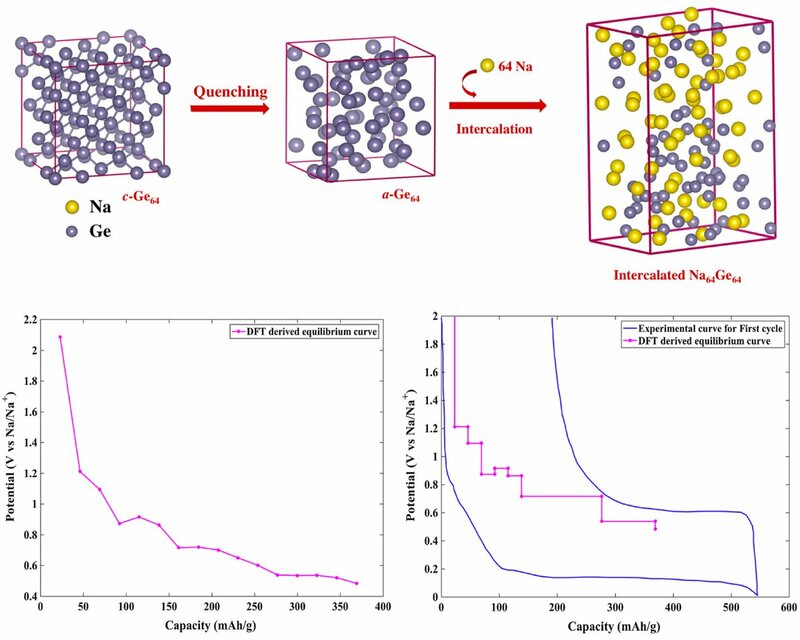 We further investigated the diffusivity of sodium in a-Ge electrode material and analyzed the volume expansion trend for Na64Ge64 electrode system. Our computational results provide the fundamental insight into the atomic scale and help experimentalists design Ge-based NIBs for real-life applications.